Does your integrator or reseller license your Fanuc Robot software? - Industrial Robot Supply, Inc. Does your integrator or reseller license your Fanuc Robot software? Whenever purchasing a used or refurbished Fanuc Robot, whether it's a stand alone unit, or being integrated into a Robotic Welding, Robotic Handling, Robotic Press Tending, or other process, Fanuc Robotics requires that end users have their operating system software re-licensed. Industrial Robot Supply, Inc, along with being an Authorized Integrator for Fanuc Robotics, is also an Authorized Relicensor. This means that Industrial Robot Supply, Inc has an agreement with Fanuc Robotics to purchase and install legal software and options registered to your company name in Fanuc Robotics database matched to the serial or F-number of that particular robot. The cost of this software and the options are included in the price of the robot when you purchase it from Industrial Robot Supply, Inc. When purchasing a refurbished Fanuc robot from Industrial Robot Supply, Inc, your operating system software will be properly re-licensed in Fanuc Robotics database. Along with this, you can assure that the latest release of the software for your control series will be freshly installed along with bug fixes for that release, and properly tested. This means that any and all programs and potentially corrupt data are erased and a completely new operating system installed. All purchased software options are also installed at this time. Your authorized Fanuc Robotics software is shipped loaded in your control, and a PCMCIA card is shipped with the software instruction manual for your records. Industrial Robot Supply, Inc. also files a copy of your authorized software on our server listed under your robot serial or F-number in case it is ever needed. This can be sent to you instantly via our dropbox server, or shipped on a PCMCIA card to be reloaded if needed. When your software is properly licensed with Fanuc Robotics, you are then able to contact Fanuc Robotics for parts for your robot if needed. 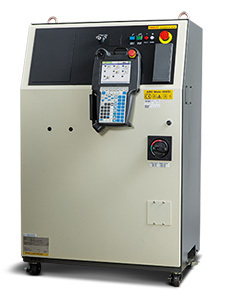 If the optional Phone Support license is purchased, you are able to call Fanuc Robotics for programming or maintenance support on your refurbished Fanuc Robot. Phone support with Industrial Robot Supply, Inc is obviously free of charge, and we also stock thousands of parts for all Fanuc Robots. When purchasing a refurbished Fanuc Robot from a non-authorized outfit, your robot will not be supplied with a legal copy of software. It may still contain software from previous installations which could contain many obstacles for a new owner to tackle from I/O references that are no longer present, hardware that is specified in the software that may no longer be present, file corruption, and programs that are taking up space and are of no use to the end user. It may also contain incorrect TCP references, incorrect parameters, and other customizations that make re-purposing the robot next to impossible. Additionally, the non-authorized unit could be shipped to you with illegally copied software with options and features that are licensed to another company entirely. So when purchasing your next refurbished Fanuc Robot, please make sure you are dealing with a legitimate Authorized Relicensor. Ask the seller if the software will be licensed with Fanuc Robotics. Keep in mind that as an end user, when contacting Fanuc Robotics to purchase a license for a non-licensed robot, the price for that software and license may be much more expensive than if it were purchased through an Authorized Relicensor. If you have any questions regarding authorized software, software options, or any other questions about re-licensing, please contact us! » How does your integrator implement a Safety System into your Robot Cell? » Does your integrator or reseller license your Fanuc Robot software?